The goal of Library 2.0 is to use Web 2.0 technology to learn, gather, combine and organize information to better serve customers. Library 2.0 is about distributing the library content and services beyond the library website, and connecting with customers wherever they are. LibGuide understands the goals of Library 2.0! Using this subscription based service, librarians can create content-rich guides, share knowledge and information, and easily promote library resources. The interface is user-friendly and equiped with Web 2.0 features. Customers are able to directly interact and improve the guides by leaving comments. They can also see and interact with the page-creator (that's you). The LibGuide widgets are COOL! These widgets (example below) allow your specific content-rich guides to be shared across social networks. 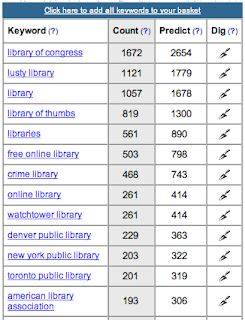 They also allow the library catalog to be searched from anywhere. Place the widget in a blog, facebook, myspace, or any website. "Professor Lawrence Lessig, renowned expert in intellectual property, has a new mission: to combat the influence of money in American democracy. Bolstered by the recent “Draft Lessig” movement that almost convinced him to run for Congress, Lessig will further his mission by launching a new “Change Congress” project in a Sunshine Week lecture sponsored by the Sunlight Foundation and Omidyar Network" (Sunlight Foundation). My purpose for posting this is simple. As a librarian, I am a huge fan of Lawrence Lessig. Lawrence Lessig is a Law Professor and Director of the Stanford Center for Internet and Society. His passionate message about intellectual property rings true. If you don't know about the FREE CULTURE movement watch this IMPORTANT VIDEO. Lessig will be speaking from Washington D.C. about his CHANGE CONGRESS project at 1:30 p.m. – 3:00 p.m. Thursday, March 20, 2008. Wordtracker is an online service designed to help businesses optimize their search engine ranking. The idea centers on strategically placing popular keywords in titles and content areas of your website. Knowing which keywords to use it crucial! If you are selling a product you need to know the specific words people are using to search for that product. Is online marketing important to public libraries? It should be!!! Finding out what library related keywords are being used can be helpful for building an online presence for libraries. Popular search terms should be used when librarians are posting to their library blogs or websites. You can do your own Wordtracker search for FREE. A two hour trial is available if you have a name and email address... Go for it!